Why York? 87% of York graduates are employed within six months of graduation. Graduate students should see their graduate program administrator before applying for transfer credits. Completed Transfer Credit Application forms are submitted to and approved directly by the Faculty of Graduate Studies (or your program). Applicants who have completed graduate level coursework, but have not been awarded a graduate degree for that coursework, may be considered for transfer credit. Proof of withdrawal from the previous program is required. Graduate level university courses are considered for transfer credit if the grade obtained is a minimum of 'B' where 'B' equals 70 percent or higher. At the doctoral level, the grade obtained must be a minimum of 'A-' to be eligible for transfer credit. All transfer credits granted are applicable to your current program of study. No more than 50 percent of the courses required in a graduate program may consist of transfer credits. 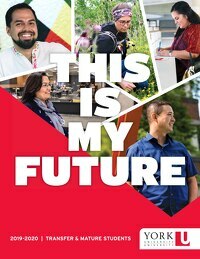 For more information about graduate admissions, visit http://futurestudents.yorku.ca/graduate/.